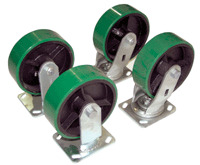 Units have a full 90 degree dump angle with a cushioned rubber bumper stop. The low profile design is essential for convenient loading. Dumping with a forklift is quick and simple. A cable is pulled from the seat of the forklift to dump the hopper. The unit returns to an upright and locked position when lowered to the ground. 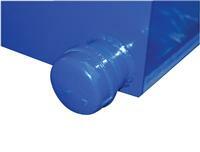 A locking chain is provided to secure the hopper to the forklift. 22 "L usable fork pockets measure 7"W x 2"H on 11-5/8" centers. 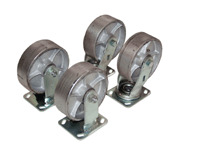 Unit includes robotic welds for a consistent, durable design. Formed base thickness is 1/4". Blue powder coat finish. 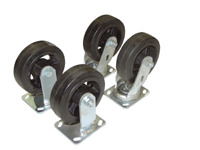 Casters - 6" Casters add about 3 1/4" to height and 8" adds 5 1/4"
Model V-HOP-SC6-2 Semi Steel; 6" x 2"; Capacity 4,800 lbs. 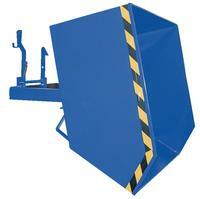 Model V-HOP-SC8-2 Semi-Steel; 8" x 2"; Capacity 4,800 lbs. Model V-HOP-RC6-2 Mold-On-Rubber; 6" x 2"; Capacity 2,400 lbs. Model V-HOP-RC8-2 Mold-On-Rubber; 8" x 2"; Capacity 2,400 lbs. Model V-HOP-PC6-2 Poly-On-Steel; 6" x 2"; Capacity 4,800 lbs. Model V-HOP-PC8-2 Poly-On-Steel; 8" x 2"; Capacity 4,800 lbs. Model V-HOP-PHC6-2 - Glass Filled Nylon; 6" x 2" Capacity 4,800 lbs. Model V-HOP-PHC8-2 - Glass Filled Nylon; 8" x 2" Capacity 4,800 lbs.